Hello again people! Yes, I know it's been at least 1 week since my last post... lazy is my middle name. But here I am again, bringing you the latest trends in makeup :) Since I run out of trends for clothing and accessories I remembered that well, I do put makeup on sometimes, so why not research a little on what's hot? Eyes: gold with smokey eyes, silver (icy eyes), pink/violet, deep colors like green, coral, blue, yellow. 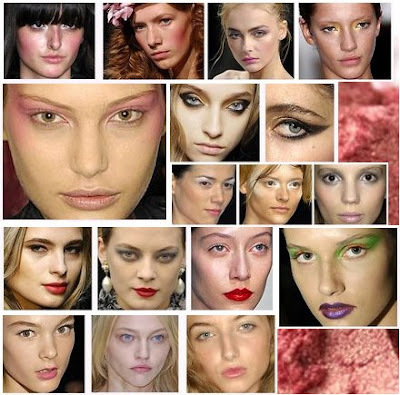 Overall I'd say pink is the color for makeup this summer: blush, eyes, lips. If you are the kind of girl that doesn't use heavy makeup I think you won't really care about makeup trends, but on what makes you look best. I'm one of those girls. When I go to work I only use a bit of concealer (aarrgghh dark circles! ), and sometimes a bit of mascara. If I go party at night then I wear some eyeshadow, mascara, sometimes eyeliner, blush, ya know, the whole kit. For me what is most important is what kind of eyeshadow to wear to make my eyes nicer. Eyeshadow color depends on your eye color, and blending in etc depends on the shape of your eye/face. Hope you enjoyed this makeup review and that it helped you a little, maybe? Read some of the ideas in the forum. I hope you liked this post and that it helps you out somehow with your dress hunt. Did you like these? Do you have any other favourite shops? If so, please tell me =) I love to find new shops in Etsy. 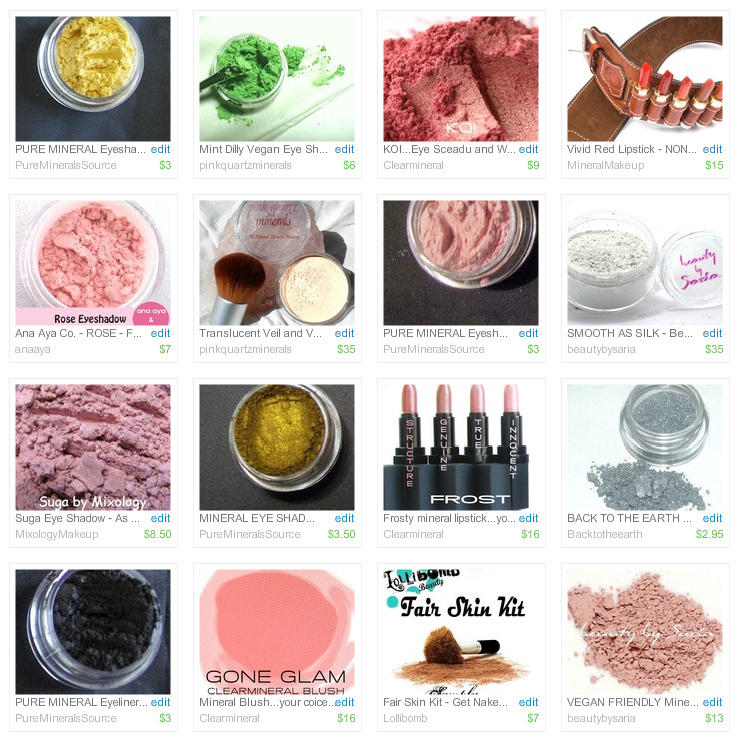 Next blog post: Summer trends in Makeup! What does the fashion world say it's fashionable to wear in the beach this year? Well, I hope you liked this trend review! What kind of swimsuit do you wear? Will you change style this summer? I did a little research again and found a couple videos about what kind of swimsuit to wear depending on your body type. Hope you like it!! And that you enjoyed the little fashion trend. Next week:... I don't know yet! Ideas anyone? So this post is for those of you that bought a babydoll dress and like me, care little about what fashion says and you are going to wear them again this summer. :) After all, it cost money, and I can't just use it only one year! And I did my research, finding this awesome video where it explains what type of babydoll dress fits you better depending on your body type. And you? Is this for you? Are you gonna wear something like this? I hope you liked it! Thanks for reading. 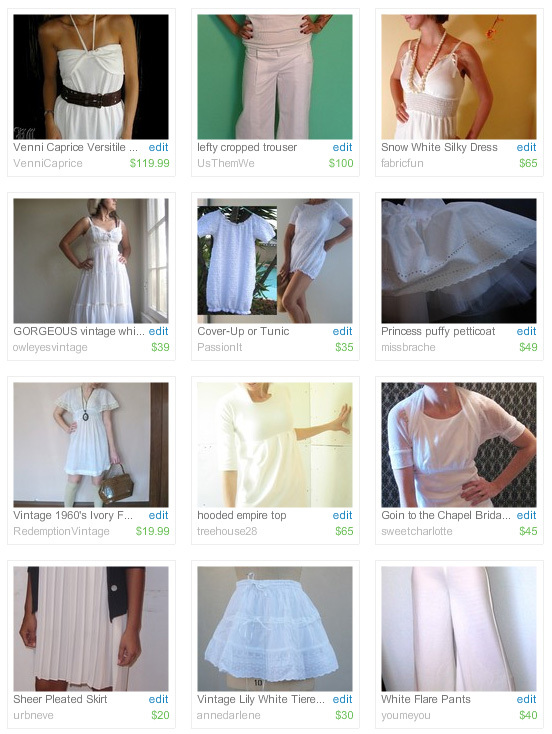 As I found in the internet, seems that white clothes are not only for babies and brides. White clothes, as we all know are a summer classic. Find that loose white dress to wear over a bikini and a pair of simple flip flops. Is this your trend? Are you going to wear any of these? On the other side, an etsy fellow requested me a custom item (this ones are handles by alchemy too) and this week I bid on another alchemy request and I got it! YAY! So two other views of the same thing: A personal sellers alchemy request, and a seller's bid in an alchemy accepted by buyer. I'm still a little confused on the payment of these. It looks like I have to send the buyer a paypal invoice, but I wished Etsy would do it automatically, like when someone buys a regular item! Make me a custom dress - Alchemy! 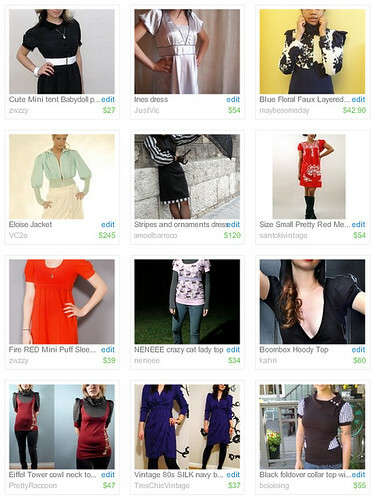 Since last summer, I have wanted to have a dress, top or skirt made with my silk designs. However, I can't sew to save my life. I made an alchemy request in Etsy. If you don't know what Etsy is, I'll tell you it's an online site where you can find thousands of shops that sell handmade items. And alchemy? 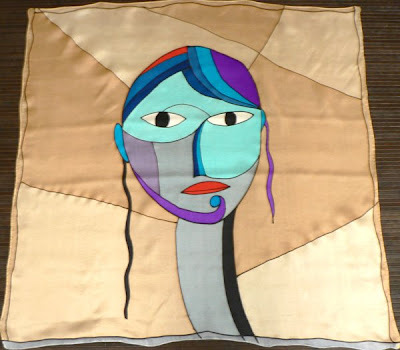 Well, it's the way to ask for something custom made, and sellers can bid on your idea. 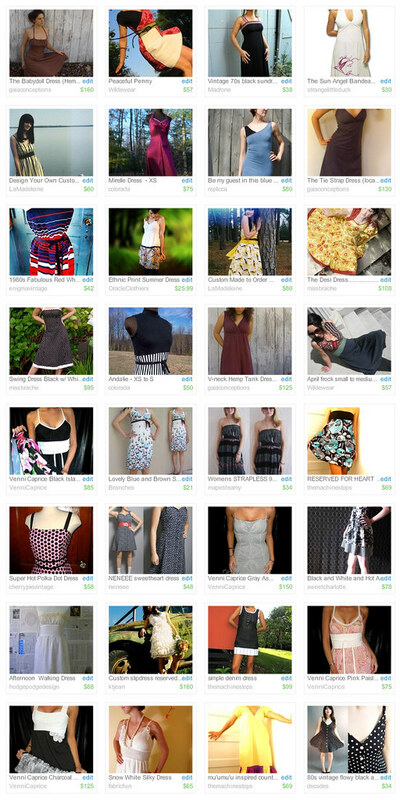 The only problem is, I really have no clue what kind of dress / top /skirt I want! I just need different ideas from people! :) What I know is that I don't want something formal, because then I will never wear it! lol So probably the key to getting for example a dress I can wear in summer but also maybe as a babydoll with leggings / pants is to make something that is not 100% made of silk, but mixed with other fabrics. 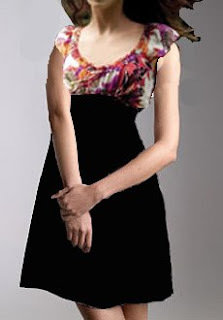 Here are a couple dresses I found in the internet. I like their style and flow, but most of them look too formal to me. I don't want this to go to a wedding or prom. See my alchemy request at Etsy. I will be posting a series on my alchemy experiences with this. Right now I got a couple bids and I'm doing the reviewing of their previous work part. Will write about this alchemy again once I find the right seller, and you'll go through the whole process with me if you want! Hi there people! This is for a little self promotion. A couple days ago I posted here the pictures of my first silk handfans. Yay! So far only one is listed, but I think you will like it! You probably are as puzzled as me! Modern Gladiator? What does that mean? I really don't know what they expect with this trend, seriously. What can I say about this trend? I have always been a fan of rockstar / motorbike leather jackets. 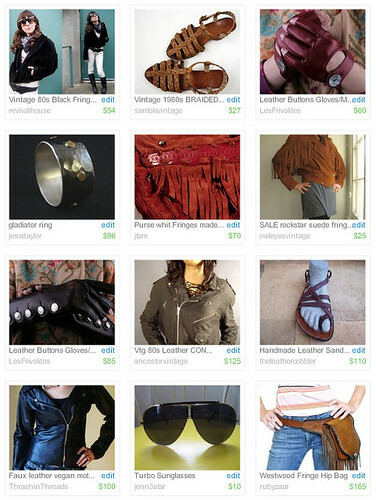 They give a "I'm a bad girl" vibe :D However, the rest of items, they are not for me! And you? Is this your trend? Read the full Fashion Tribes article here. This was the last season trend to review. I hope you liked reading them as much as I liked writing them! So I thought, what can I do next? 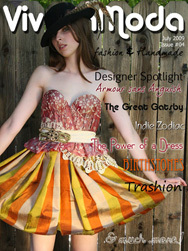 I really liked writing about fashion. Surfing the net I found an article on the must have clothing items of this spring / summer. Not like a general idea, but more like specific items or prints. After reading it, decided I could start writing about that too! :) The fun is not over yet! 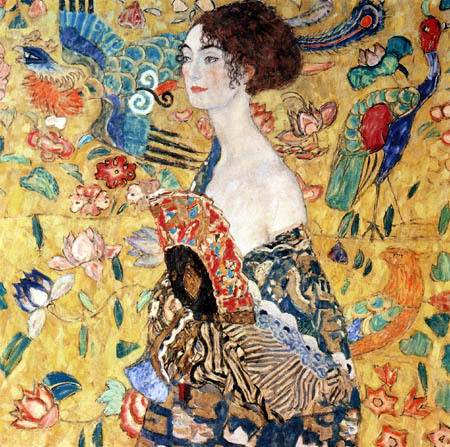 Please, if you would like to see a review on a particular clothing / jewelry / accessories item please add a comment about it and I'll see what I can do. This post is for a little self promotion AAAND some history + culture of the handfan. But I think you are going to like it. 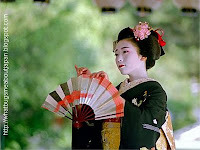 I have always loved the look of handfans: either through history, when the court ladies used them to seduce men or conspire; or nowadays, when the summer gets too warm and we just need something to not die in the sun! Of course, there are many kinds of handfans, but I really don't know what's it's origin, who invented it or in what country was introduced. 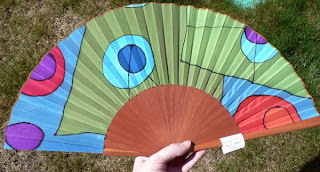 Correct me if I'm wrong, but I think nowadays the most famous different kinds of handfans are the japanese ones and the spanish ones. In Spain, the handfan is a strong point of our culture. It is in our tradition, and most women have at least one, mostly used to fight the hot temperatures in summer, but also very famous in the popular dances of south Spain. In the times when all the ladies used a handfan, it was used to send messages (usually secret love messages!). There were no cell phones! The position of the face, handfan, hand, etc would indicate the message. Close the handfun under your right eye = "When may I see you?" Cover the left ear with the open handfan = "Don't tell our secret"
Fully open the handfan = "Wait for me"
Handfun on the back of the head = "Don't forget me"
Turn the handfan with the left hand = "Somebody is watching us"
Turn the handfan with the right hand = "I love somebody else"
Move the handfan between the hands = "I hate you"
Move the handfan around the cheek = "I love you"
To fan (use the fan) very fast = "I'm madly in love with you"
To fan very slowly or open and close very slowly = "I'm a married woman, don't try anything"
So a couple weeks ago I sent a couple of my silks to some people thatmake handfands with different fabrics. After seeing a few silk handfans in some high end fashion stores, I decided I could as well make them with my designs. Now you have an excuse to feel like a lady of the XVIII century! 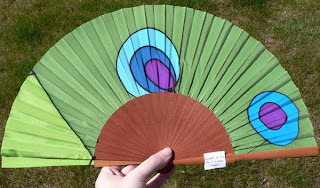 =) Seduce your man with one of this handfans. Soon I will have some in my etsy store. For now, just tell me if you like them or not, please. Is this your style? Would you use one in the hot summer? Handfans are very used as decoration too! Today: Puffy sleeves! Oh yeah baby. You never thought this would be back, did you? Well, we have for all tastes here, from super huge ones to regular ones. Seems big designers, as always, are for the extreme ones. I like better the regular ones. In fact I think a little puffy sleeve looks really good. And you? As the Fashion Tribes article says, a blouse or jacket with puff sleeves is very feminine, and will work well with a full skirt, high waisted trousers or a pencil skirt. So what do you think of this trend? For me it works, if the sleeve is not exagerated. Stay tuned for next and last trend: Modern Gladiator - HUH??? Next fashion trend will be the last. So please, if you have any ideas or suggestions about what should I talk about in my next fashion post, please tell me!! =) Leave a comment! Back with more fashion for you guys! I should be working instead of doing this, but working is way too boring. So here it goes! The perfect top part is a puff sleeve blouse, or anything that tucks in. You don't want to hide that waist, do you??? Small waists will benefit from this trend, I'm sure! 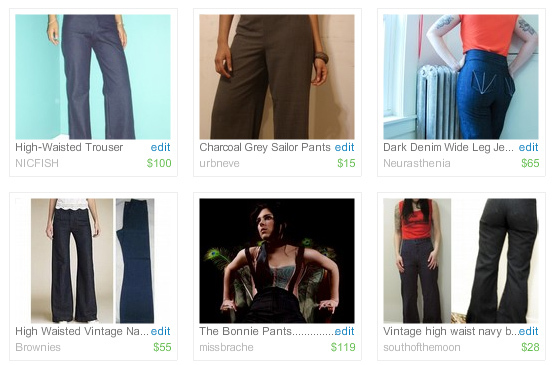 Sellers, from top to bottom, left to right (link to the item), are: NICFISH, urbneve, Neurasthenia, Brownies, missbrache, southofthemoon. From those trousers you see there, I really like missbrache ones. Well, in fact, I think everything in her store is really cute! Hoping you have liked this trend. 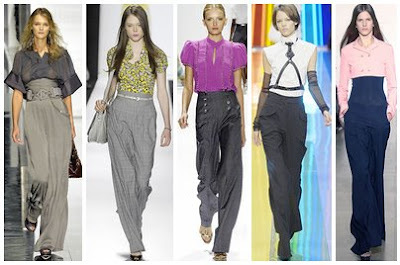 Will you be wearing these kind of pants? 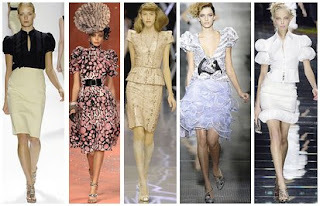 And next trend: Puffy Sleeves!!! !